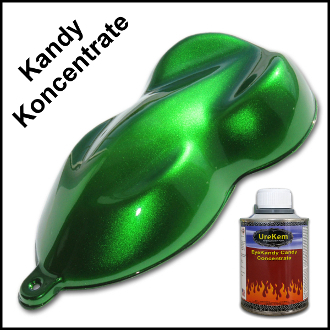 EyeKandy Emerald Green Candy Concentrate - Buy Custom Paint For Your Automobile Or Motorcycle At Discount Prices! Up for sale is a half pint (8 ounces) of Candy Concentrate. We recommend candy concentrate be used to tint and enrich existing basecoat or candy colors. We don't recommend they be used to make candy colors from scratch since candy from concentrates does not last as long as our standard EKU, EKB, or KGC series candy colors. How much candy concentrate should I add to my paint? Generally we find that 8 ounces of candy concentrate per gallon (2 ounces per quart) will tint an existing color and add more depth. Up to 32 ounces (4 bottles) per gallon can be added per gallon of color. Not all colors show the candy effect when mixed with candy concentrate. Always do a test panel to test the effect before proceeding. Shipping is based on order total and orders over $400 ship for free to the continental USA!. Visit our shipping map for an estimate of how many work days it will take for you to receive your product. 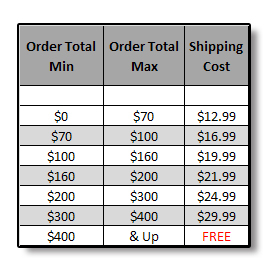 See the shipping chart below for shipping cost to the continental USA. Check local regulations before purchasing. This item can only be combined with certain low VOC items to make a sprayable low VOC finish. Contact us at info@thecoatingstore.com for more details.